Recently, I was toying with the idea of steaming a few cakes using my ricecooker since I am gonna be the host for next month's Aspiring Bakers (let me take the chance to advertise this event) and the theme is gonna be Steaming Hot Cakes. 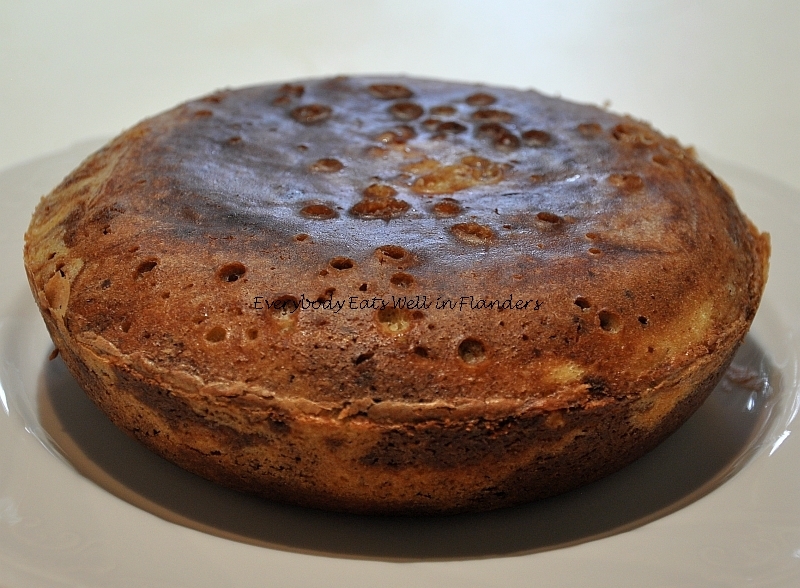 I thought it would be great to discard the conventional notion that a cake should be baked and explore steaming a cake using an unconventional method - the humble ricecooker. However, there are not many cake recipes on the web that teach you exactly how to steam a cake using a ricecooker. I manage to find a Toshiba ricecooker pdf manual that documents how exactly to bake steam a cake using the Cook, Rapid Cook or Congee setting in a Toshiba ricecooker. That is a godsend since my Toshiba does not have a Cake function like some of the more expensive, advanced models. I also found another recipe (which I have no idea where I found it from, certainly not from Toshiba) that only says "Press Cook and allow to bake for 50-60 min". Somehow this recipe attracted my attention and I decided to give it a try since it looked pretty straightforward and I thought the instructions should be applicable for all types of ricecookers, not just Toshiba. 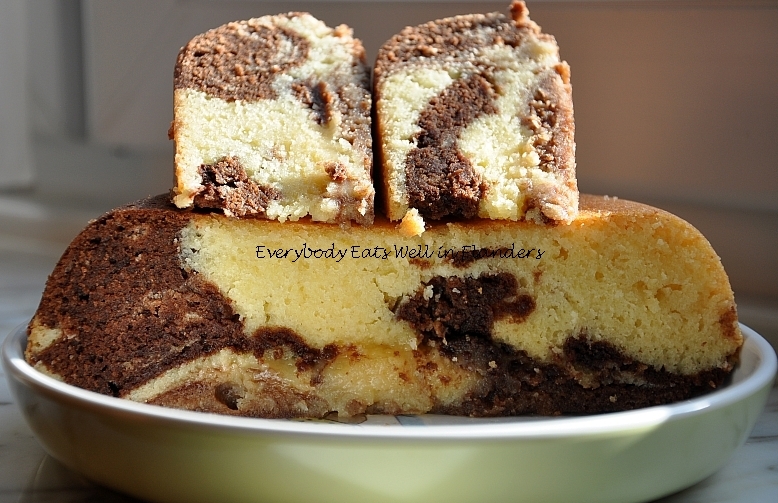 So it was this recipe which I used yesterday to steam my very first ricecooker cake - a Chocolate Swirl Butter Cake, better known in layman terms as a Marble Cake. Here it is, my very first (toshiba) ricecooker cake. Just look at the resultant cake when it first came out of the ricecooker, doesn't it look like some volcano crater? Haha. But when you turn it around, it looks very nice and curvy, a beautiful dome-shaped cake. Look at the crust, isn't it beautiful? The chocolate swirl should have been more spread-out instead of being concentrated in one area, that was my mistake, as I disregarded the instructions and did what I did previously for my oven-baked marble cake. :( Otherwise this would have been a beautiful ricecooker steamed chocolate swirl butter cake. If you look carefully enough at the picture below, you will notice that the centre of the cake (actually the top of the cake since the cake was inverted) was a bit wet. I actually had an inkling of the problem when I first opened the ricecooker, I poked the surface using my finger and noticed that the cake was firm and springy to the touch at the sides but the centre seemed to be a bit soft. But I was hard-pressed for time yesterday, this cake was actually meant to be brought to somebody's house, and I was already late for the appointment. So I just took the cake out, turned it over, and cut it into half. Indeed, the cake was a bit wet and lava-like right in the middle, about the area of a 2-cm circle, but the rest of the cake was well-cooked. I was disappointed since I couldn't bring the cake along. But tastewise, the cake was very yummy. It was sweet, moist and buttery but not crumbly, and a bit chocolaty. Honestly, it tasted just like an oven-baked marble cake. You wouldn't have guessed that this was a cake steamed in a ricecooker. The crust was especially firm and crispy and the cake tastes even better the next day. I was pondering and hesitating whether I should publish this post at all as it was not exactly a 100 percent successful cake (on a scale of 10, i would give it an 8 to 8.5), but I thought it might be interesting to those who are learning to make cakes using their ricecookers. Furthermore I think I should also document my experience so that I can learn from my mistakes, and I can share my experience online with others. 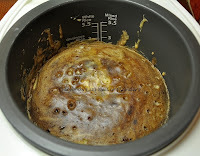 Hopefully some readers (if there is anybody reading my blog at all) will be able to feedback and give me a pointer or two, on their own experiences and how to improve this ricecooker cake recipe further. 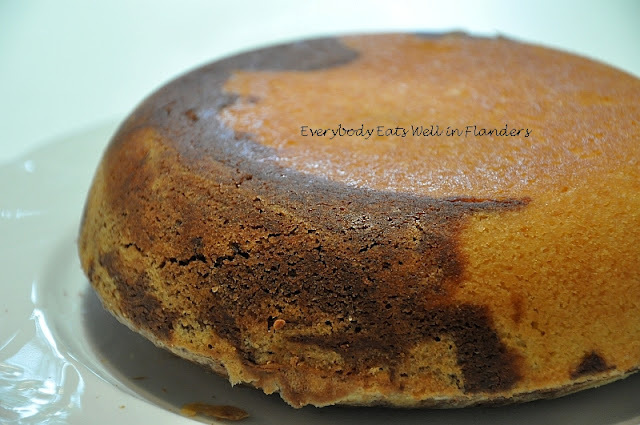 So here is the recipe of my very first ricecooker cake, a handwritten recipe adapted from Gourmet Haven (link unknown). 1. Cream butter and sugar together till light and fluffy. 2. Mix in 3 eggs and 1 egg yolk, one by one. 3. Fold in sifted flour and baking powder. 4. Fold in melted chocolate (mix a little to create a spiral effect). 5. Pour mixture into a greased rice pot. 6. Press "COOK" in the ricecooker and allow to cook for 50-60 minutes at least 60 minutes. 7. Cool the cake for a while, then flip the cake out onto a plate. 2. Remember to grease the rice pot. No doubt the rice pot is non-stick, but you should still grease the pot slightly, no need to use too much oil/butter/baking spray as this is a butter cake which is high in fat content. It will slip out of the pot in a split second when you invert it. Use a plate to cover the top of the pot before you invert the cake. Do not use a knife to loosen the cake as you will risk damaging the non-stick surface of the rice pot. 5. You know what, I was a smart-aleck. I took out half of the batter after step 3, and added the melted chocolate so that there was a portion of plain batter and another portion of chocolate batter. Then I tried to add alternating spoons of plain and chocolate batter, just like my oven-baked marble cake. But it didn't work very well for me, cos the batter was not fluid enough and I had difficulty achieving the spiral effect of a marble cake. On hind sight, I should have stuck to the original step (which I have written above) of just adding melted chocolate to the batter in step 4 and pour the whole batter into the ricecooker pot. Finally, someone tried my 1st rice cooker cake, I shouldn't have dismissed this marble cake without giving it another chance, should have tried it again and cooked it longer, maybe 10 to 15 min more! 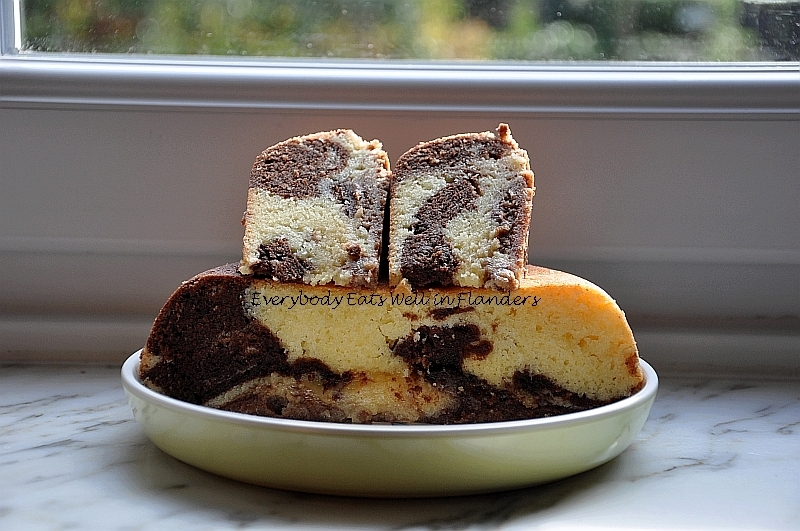 On 2 May 2014, Cat from Malaysia emailed me a foto of her lovely rice cooker marble cake saying "I baked your recipe yesterday. Super soft cake n yummy! Thank you very much for sharing! Next round if I bake, I will reduce sugar (because for current recipe I've added more melted dark chocolate coins hence a tad too sweet) and use 3 eggs instead of plus 1 egg yolk because it tasted a bit 'egg-gy'. And my Panasonic rice cooker (without bake function) cooked it at around 43 minutes! Really yums! Thanks again for sharing!!! Please share more." Cat was using Panasonic SR-MPA18, 10cup capacity. Thank you Cat for your feedback! Miss B we tried this out today! Email you for more info. I am planning on using my rice cooker to make a lemon drizzle cake today - I have an oven so it is for no other reason than I am curious how it will work. Thank you for this post it has given me confidence to give it a go. Good luck to your lemon drizzle cake! quick question, when you say "Mix in 3 eggs and 1 egg yolk, one by one." Does that mean you will use 3 egg whites and 1 yolk? thanks for your help, cant wait to try this! my rice cooker is simpler one, and it has a vent hole on its lid, can i still bake cake in it? Hey Hermione! Remind me to reply to you! I just whipped everything together and I also have a simple rice cooker. I'l let you know! ya..i was thinking of blocking that vent hole with something, or is that a bad idea? It is indeed a bad idea, the vent hole exists for a purpose, to let off steam. You should not cover it, otherwise the steam has no way out during steaming. 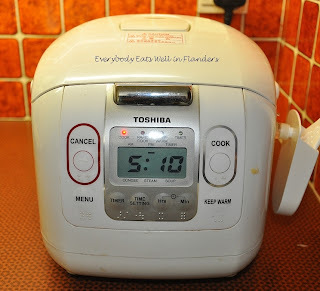 If your rice cooker is a simple one that has one button, you have to press that button and wait till it pops up, and if that happens before 1 hour is up, you have to press it again so that it will continue to cook. 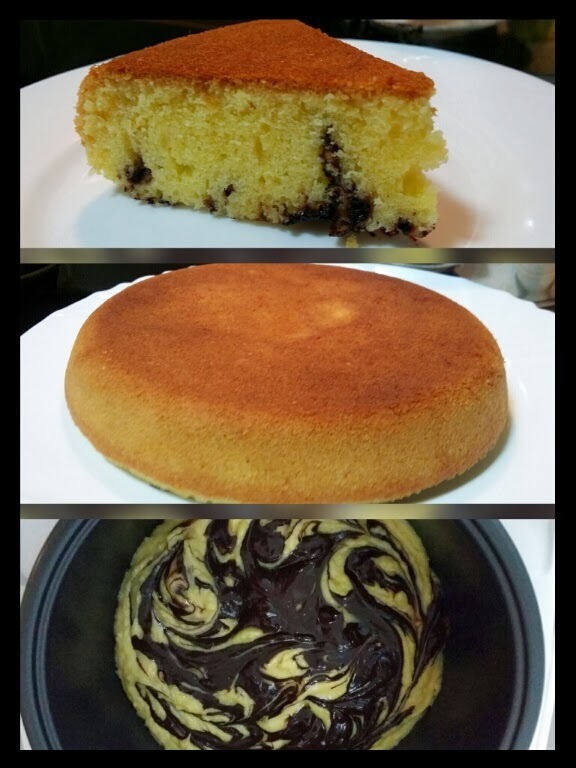 For a failure-proof rice cooker cake, I would suggest you try the chocolate lava cake or the green tea cake in my blog, those 2 are better than this marble cake, which I find it too wet. Otherwise you really have to cook it longer, say 1 hour 15 min or so. I still have to modify this recipe and try it out again for a better result. thanks..definitely gonna make it ...its for someone's birthday!!! so excited..
Hi Ms B, I love all your posting on the rice cooker cakes. Thanks for all the wonderful sharing. 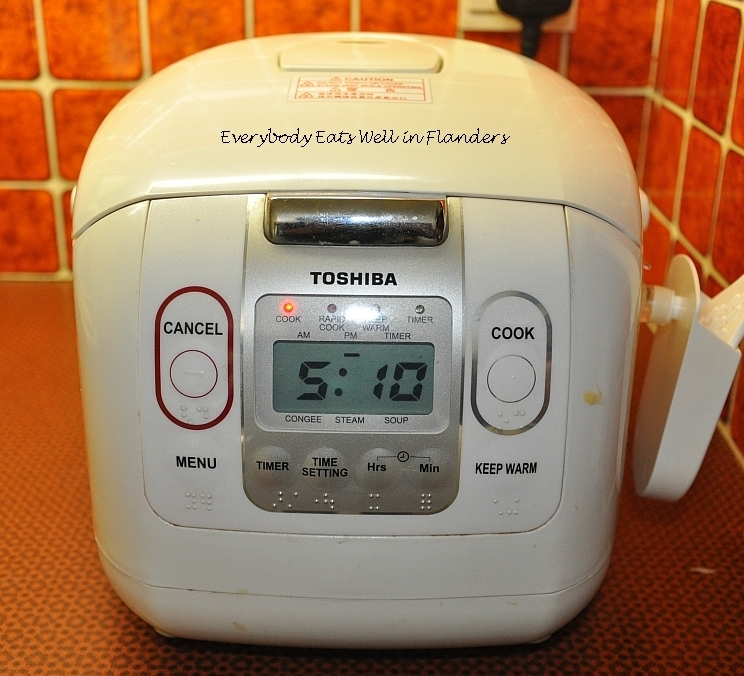 Can't wait for you to explore on making rice cooker bread! will you? MS B, Thanks for all your postings on rice cooker cakes! I'm eager to see your try out on rice cooker bread! will you? Sorry I missed seeing your comment. I will try it when I find a good recipe on rice cooker bread. Hi, can use this recipe if i want to steam it traditionally? Yes, of course you can, though I have not tried the traditional way. Guess you have to steam for at least 1 hour on medium-high or high heat. Thanks for leaving me a comment. Frying kuey teow using rice cooker, that's new to me, thanks for the link. This recipe has to be tweaked further in terms of quantity, it doesn't cook within 1 hour. I suggest you try my rice cooker banana cake or the recently added rice cooker butter cake instead. Hi there, just happened to see your lovely blog. So inspired! Small problem... I dun hv weighing scale, how do I measure the ingredients? Sorry that I missed reading your comment. I was just back from hospital at that time. You can use this link for weight conversion. Hi thanks for sharing the recipe. Im using the same rice cooker. Can I ask if u had any problem with the overflowing liquid from the steam vent when cooking rice? Thanks. Pls leave your name or nickname for easier identification. I don't answer anon. qns. Hi ms b..im jen ere..happy that i abke to search the rice cooker baking recipe ere...im using the toshiba bigger version which come with baking function...so i can select the baking function ? Have any idea how long is the duration for the baking function? Yes, you can use baking function. Not sure how long it would take, this cake would take about 1 hr 10 min for 5.5 cup Toshiba, so for a bigger Toshiba with baking function, may take anything from 45 to 1 hour, you would have to observe and judge for yourself. But the cake would be very flat if yours is a 10 cup. You may open the lid > 1 time and use a toothpick to check if it's done, it wont collapse since its not chiffon cake. But I know the cake is more or less cooked when I can smell the cake aroma, so you can let it finish the baking cycle once you smell something. Hihi Ms. B, i am new to baking in fact nvr bake before so would really like to have ur advice. Sorry if the question I ask seems stupid to u, my apologies for that. what do u mean by cream butter and sugar together? How do u do it? How do u sift flour and baking powder and what u mean by fold them in? Lastly, can I melt chocolate using steamer instead of microwave? I do not have one. Or is there any other ways to melt the chocolate? What are some nice chocolate to try out with? It would be great if u can name some. Also, are there any videos that I can view to show the step by step ways of baking cake using rice cooker? Thank you so much. U inspired me to start baking. Hopefully I am able to succeed. . I will try to answer your questions to the best of my abilities. 1) Creaming of butter and sugar means beating/whisking with an electrical hand-held mixer or a stand mixer (eg. KitchenAid or Kenwood) or sometimes even with just an egg whisk. See video on how to cream butter and sugar. 2) See video on how to sift flour and baking powder. 3) See video on Joy of Baking's Chiffon Cake video, you will learn most of things there, like how to fold flour into batter. Joy of Baking is a very good website, do take time to read and view the videos. But note that making of chiffon cakes is quite advance and is not for beginners. Start with an easy cake first. 4) No, you should not melt chocolate in steamer. If you don't have microwave, you should melt the chocolate in a heat-proof bowl placed over boiling water in a pot, this is called bain-marie or hot water-bath method. 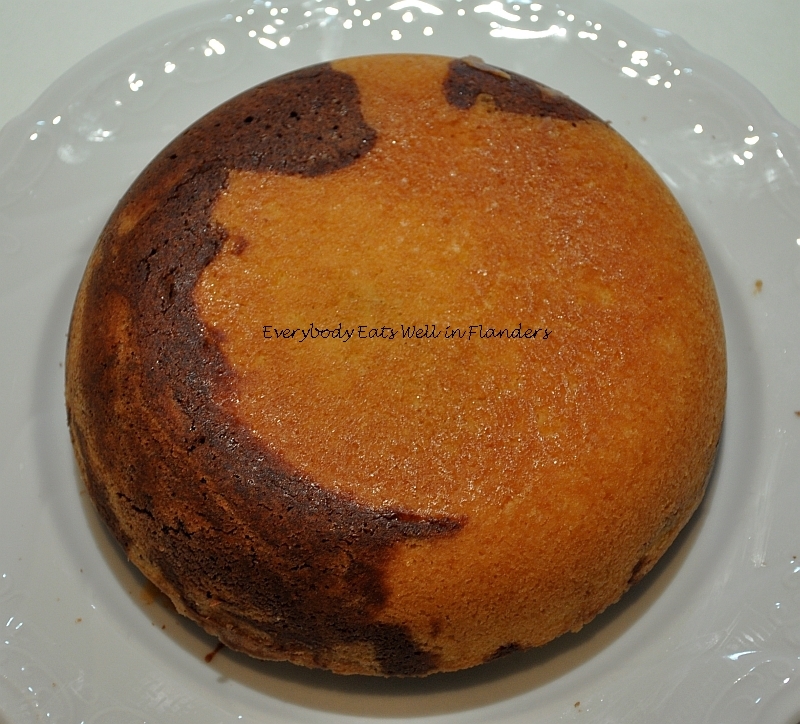 how to make japanese kasutera cake in rice cooker. This is the recipe which I used for my RCC #7. It does not really cover the step by step of making a rice cooker cake. This is only specific to her kasutera cake. Hi Miss B, where did you get the rice cooker? I am very interested in it. Does it cook rice well? So far, I've tried your Banana cake, Banana chocolate cake & marble cake. I follow exactly of your recipe. My rice cooker has cake function. After mixed every ingredients n press "bake" function. The rice cooker cakes come out nicely. Looking forward to try your other rice cooker cakes. Thank you for sharing such wonderful rice cooker recipes! Butter must be salted or unsalted ? I always use unsalted butter. In this case, there was no mention of a pinch of salt, which is required if unsalted butter is used. So it's up to you to use either one. I use Bluesky brand of rice cooker. In fact, this is my hubby lucky draw present from his company. :) I'm not familiar with this brand at all. There are many functions, including regular, quick, cake, porridge, reheat, brown, steam & soup. I use it for few months, so far I find it very good, it much better than my previous Tefal brand. It is non-stick rice cooker. Probably u can search more detail from web. I just tried your recipe but my cake turned out to be crumbly. What should I do to make it moist? Maybe you cooked for too long, or your eggs are too small? To make it more moist, check your cooking time and size of eggs, if it's too dry, add a little more egg (you can add a little milk or plain yoghurt too). I follow each every of your step and my cake turn out to be disgusting sour taste. May i know what went wrong? Not sure what went wrong, never had such a feedback before. Maybe it''s your butter , has it turned rancid already? 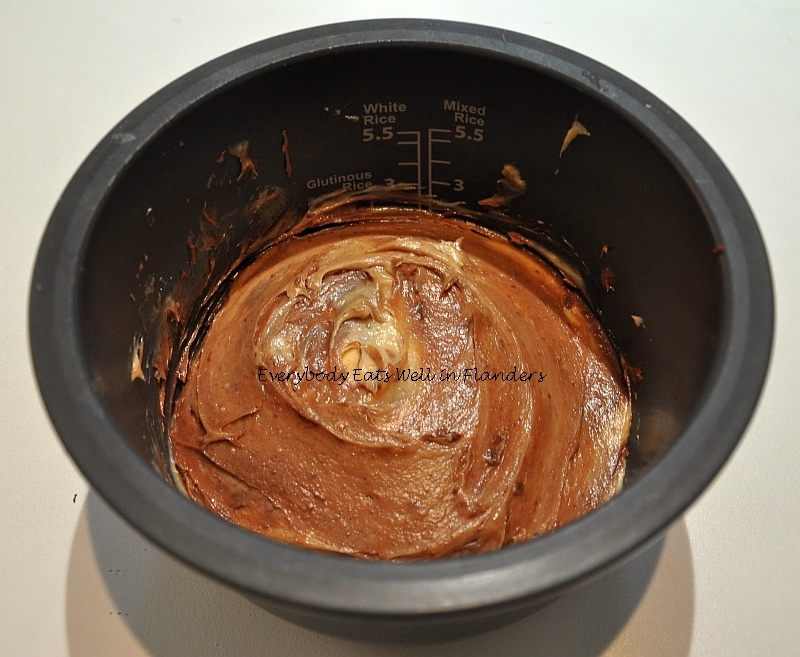 Can I 1st pour the plain batter into the rice cooker, then pour the melted chocolate and swirl it to create the effect? ?